Happy birthday Nina Bawden, Granny the Pag,and Pat Mora, Book Fiesta. In 1840, Captain Charles Wilkes completes circumnavigating Antarctica, claiming what became known as Wilkes Land for the United States. Read Antarctica: Journeys to the South Pole by Walter Dean Myers. It’s National Popcorn Day. Read The Popcorn Book by Tomie dePaola; Popcorn by Alex Moran, illustrated by Betsy Everitt; and The Ghost of Popcorn Hill by Betty Ren Wright, illustrated by Karen Ritz. It’s also Tin Can Day. Read The Tin Forest by Helen Ward and Wayne Anderson, and Gregory, The Terrible Eater by Mitchell Sharmat. As all who closely follow the children’s books world know, around this time of year the major children’s book awards (Newbery and Caldecott) get announced at the annual ALA meeting. Many enjoy the process of Mock Caldecott or Newbery award events, a way to get everyone involved. In my case I sit down every year with one of my favorite children’s book designers, Carol Goldenberg, and we pour over piles of books. 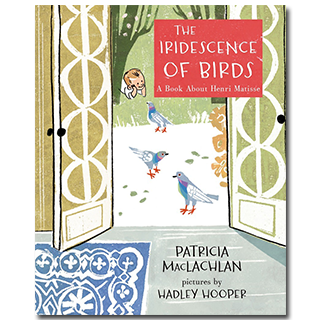 In that process, I became entranced by The Iridescence of Birds: A Book about Henri Matisse by Patricia MacLachlan, with pictures by Hadley Hooper. 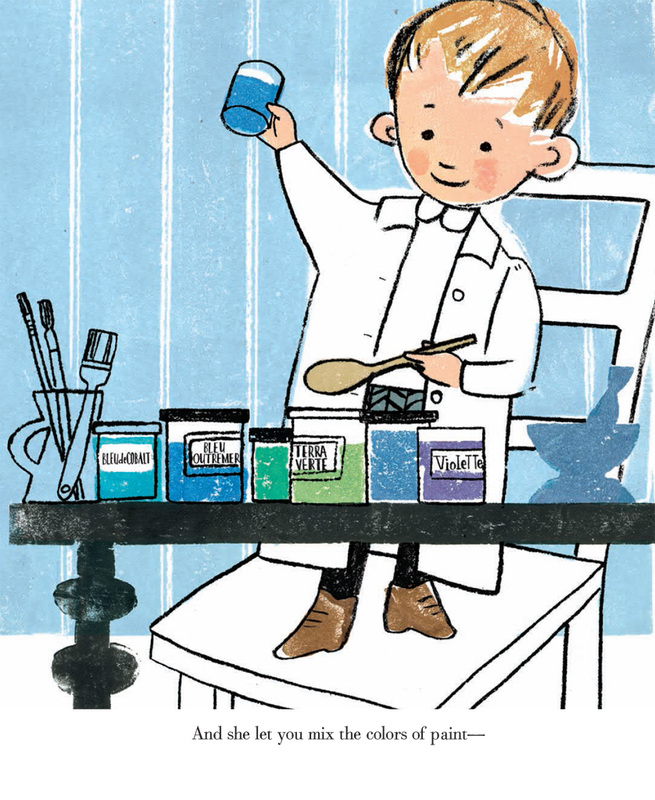 MacLachlan based her story on a statement from Matisse saying that he got his sense of color from his mother, and in only a few words she has given us an example of the perfect art education book for a child. Much like Me, Jane, The Iridescence of Birds shows how the influences of childhood shape the profession of someone who becomes world renown. Rarely have narrative nonfiction texts used so few well-chosen words to convey the essence of a life. And MacLachlan is not afraid to take a new vocabulary word, iridescence, and make it understandable for the picture book set over the course of her narrative. But as masterful as this text is, it has been matched and exceeded by the art. Hadley Hooper used a form of relief printing, described in the end note, which provides a feeling of Matisse’s work without being a copy. Light, color, movement, and superb composition of each double page spread make the book a visual feast for the eyes. Added words in French extend the vocabulary – making this life of Matisse also useful as a bilingual picture book. A large trim size, pleasing font, and thoughtful design add to the pleasure of reading and rereading this volume. So many fabulous picture books were published in 2014. Anyone who worries about the demise of this form need only look at the vitality and creativity shown in titles like The Iridescence of Birds. I look forward to the ALA announcements on February 2, as I do every year, to see what fine creators will be recognized. Originally posted January 19, 2015. Updated for . I am in love with this book. And I sure wish I could have been a fly on the wall–or even a dog on the floor–while you and Carol discussed picture books. I am green with envy. I just happen to be in two college art course now to gain skills in illustration for my own words in children’s literature, so I can’t wait to get hands on this one. Perfect timing! One of my favorite picture books of the year! Text and art in perfect consort. Thank you so much for this recommendation, Anita. I just ordered it from my library.